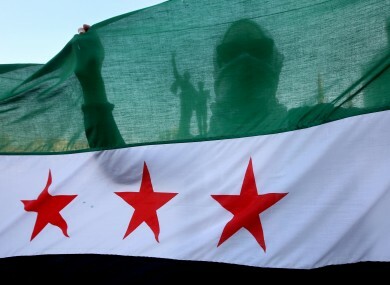 A Syrian activist is silhouetted through the Syrian revolution flag. NOT EXTENDING THE existing arms embargo on Syria will risk making the situation for civilians in the country even worse, according to international aid agency Oxfam. EU Foreign Ministers are meeting on Monday and the humanitarian agency says failure to extend the EU arms embargo at the end of the month would be “irresponsible and could scupper the fragile glimmer of hope for progress offered by the US-Russian peace summit scheduled for June”. UN figures show that more than 80,000 people have already lost their lives since the start of the Syria crisis two years ago and almost seven million people inside the country need humanitarian aid. Currently, the EU arms embargo forbids the transfer of lethal weapons to Syria – whether to government forces or the opposition. There are no easy answers when trying to stop the bloodshed in Syria, but sending more arms and ammunition clearly isn’t one of them. International efforts should be focused on halting arms transfers to all sides and finding a political solution to the crisis. There are serious risks arms could be used to commit human rights violations. And the risks of diversion of weapons and the likely humanitarian consequences are very real. We are already seeing the catastrophic humanitarian impact of this crisis on civilians. While a relaxation of the arms embargo would “pave the way” for EU states to arm the opposition, Oxfam states it would “almost certainly fan the flames of the conflict and cost lives”. Mr Clarken said the UK and France are taking a “risky course of action” and that diplomacy “should be the priority”. Email “Oxfam urges EU foreign ministers to extend the arms embargo on Syria”. Feedback on “Oxfam urges EU foreign ministers to extend the arms embargo on Syria”.